He’s been referred to as the JRR Tolkien of Chinese literature and the grandfather of martial arts novels – but very few people have heard of him outside the Chinese-speaking world. “I don’t think there’s another writer that’s been read by more people [in the Chinese-speaking world], period,” Eileen Chow, a visiting associate professor of Asian and Middle Eastern Studies at Duke University in North Carolina, told the BBC. Mr Cha was born in China in the eastern city of Haining. He moved to Hong Kong in 1948 where he worked as a deputy editor of a local newspaper. Between 1955 to 1972 he wrote 15 novels, including his most famous The Legend of the Condor Heroes – the first in a trilogy following two soldiers during a time of war in the Song Dynasty. The Cultural Revolution was taking place – a period of time where Chinese leader Mao Zedong gave licence to “destroy” much of the “old Chinese culture”. “During that period in China, martial arts was considered spiritual pollution, so while he was being read by people in places like in Taiwan, Hong Kong and Singapore, he wasn’t as well read in China,” said Ms Chow. In addition to fiction, in 1959 Mr Cha co-founded Chinese-language newspaper Ming Pao – now one of Hong Kong’s leading publications. 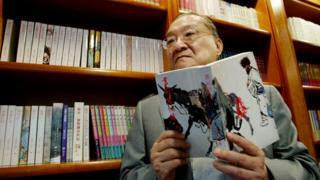 Mr Cha’s fiction novels popularised the Wu Xia genre, fantastical stories of martial-arts heroics and chivalry. “Think of it as part fantasy, part Chinese history, part romance with magical elements, with heroes and villains,” said Ms Chow. His novels also prominently feature female leads who are all “feisty and have lots of character”. “In his books, women are not only the backdrop, they are the martial artists [themselves],” Ms Chow added. Tributes are pouring in from all across Chinese social media. The hashtag JinYongDies was viewed over one billion times on Weibo. “He shaped my entire worldview of martial arts… it feels like a figure from my childhood is gone,” said one user on Weibo. “It feels like the end of an era. I don’t really want to accept it, but he’ll live forever in my heart,” another user added.